Do we need two Missions? The CBC tonight had an investigative report on a development in Mission. Once again it features a well qualified professional civil servant being pushed out of his job because he insisted on doing his job properly. Genstar (those lovely people who brought you the hideous Mary Hill development) now want to wreck a unique ecosystem with yet another subdivision. And as usual our provincial government is on the side of big business and in favour of wrecking what it likes to call “the best place on earth”. Finally, this story is poised to catch fire, after smouldering for several years now beneath the forested canopy of Mission’s rural community of Silverdale. A new CBC story exposes the battle between local residents driven to protect their quiet farming community and delicate ecosystem – home to important salmon habitat and diverse fish and wildlife – and one of North America’s largest developers, Genstar. The Mission residents, working under the banner Citizens Against Urban Sprawl, are outraged at a massive development proposal by Genstar (some will recognize the name from Coquitlam’s Mary Hill monstrosity), which has been championed by Mission Council. Essentially, they plan to clear-cut the top of the mountain to make way for up to 5,000 homes – plus more on a tiny, fragile island in the middle of Silvermere Lake, below – with no regard for what will happen to local drinking water, as longtime residents of the community are all on springs or wells. It’s not just the environmental and social implications of the project that have raised alarms, but the undemocratic process by which the development is being pushed through. 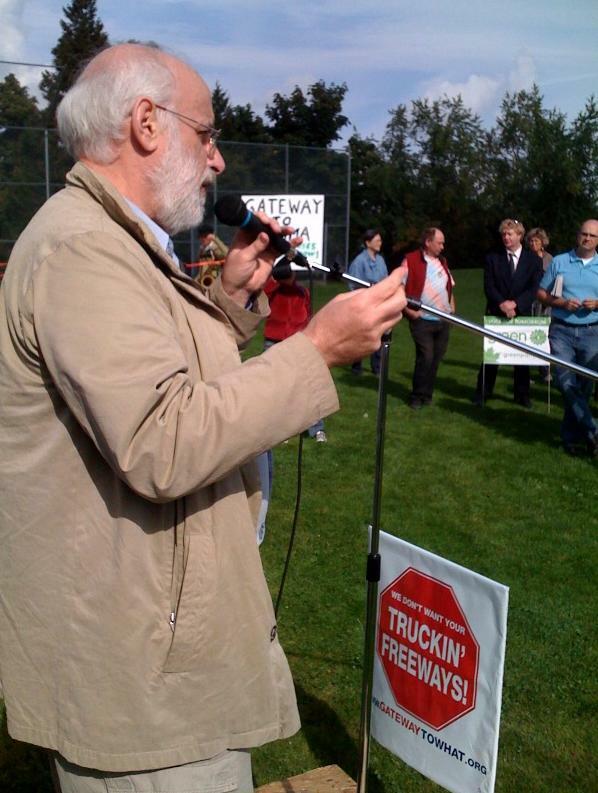 Esteemed biologist Dr. Marvin Rosenau left the provincial government after being subjected to severe political pressure and interference for writing a report that decried the development for strong environmental reasons. To be clear: we do not have an economy that is somehow more important than the environment. The economy is a subsidiary of the environment. We depend for our continued existence and health on a functioning ecosystem. We have become the biggest threat to our own life. In Canada – and BC – we have have reduced environmental protection to a PR stunt. Our processes protect nothing if there is money to made by wrecking it. We have reverted to the philosophy of the first European settlers, who saw the New World as a limitless supply of resources that they could pillage just as comprehensively as they had the Old World. It does not have to be this way. There are plenty of examples of systems which have managed to both have a high standard of living and a functioning ecosystem. But we continue to behave as though these processes could never be made to work here. Meanwhile the Swedes will be (fossil fuel) oil free in 20 years. The Danes have become world leaders in wind power, and have made Copenhagen a place where citizens want to be out of doors all year round. Norway, also a major oil producer, has manged to reduce its ghg emissions. The legacy of Campbell and Harper is of a system which is totally unsustainable. That means if we continue this way, we go bust. And sooner rather than later. We need to be able to make decisions about development that are senbsible, and make the future better, and not worse than it is now. A process which assumes that any devevlopment can and should proceed, provided enough promises of mitigation are made is simply not worth having. The damage to our environment is all around us, plain to see anf far too great to be allowed to continue. It seems very clear to me that the real issue this federal election ought to be climate change. And clearly our current Prime Minister is not interested. He’ll do a soft shoe shuffle about his almost worthless proposals will actually be implemented and go after the last Liberal government’s shameful record. But really he is no better. So this website should help you make up you mind who to vote for. I do not know if normally I would endorse strategic voting, but obviously if the progressive vote is split the Tories are back – and possibly with a majority. If I thought that Richmond East/Delta was winnable I would vote strategically. But it isn’t and the NDP candidate is an immature twit. And I am not going to vote Liberal after they broke every single red book promise I was suckered into. You must make up your own mind but maybe looking here will change your mind. Or maybe you would prefer to read what Greenpeace has to say about it. Since they are not a charity they have not been muzzled by the Canada Revenue Agency. I seemed to spend a lot of time this weekend with a microphone in my hand. I have already written about Saturday’s rally so this post just looks at Sunday. At Connaught Park I was very pleased to meet Michael Byers, the NDP candidate for Vancouver Centre. He recently called for the closure of the tar sands. He pointed out that he had merely put the NDP position in “less nuanced language”. I told him that though I was committed to voting Green, if I lived in his constituency I would vote for him. To read more about him there was an interview in this week’s Georgia Straight. He certainly comported himself better than the NDP candidate for my riding who demonstrated her naivete – or perhaps incomprehension – by trying to get herself and her home made and almost unreadable banner into every lens by standing immediately behind the speaker at the event. Even when that was someone offering a solemn native prayer. She did not respond to requests from the organisers, who suggested she show some respect and sensitivity but did co-operate when when Micheal Byers told her (kindly but firmly) to stop making a nuisance of herself. She probably damaged the NDP’s very slim chance in her riding as it covers not only East Richmond but also Delta. She does not get my vote or name recognition here. I was also pleased to meet Rafe Mair – long a personal hero – who spoke first and every well – despite being in a serious car crash earlier that weekend. He had been cut from the vehicle he had been a passenger in by the Jaws of Life and was walking with a cane, and had several bandages. It is a great shame that he should be a victim of the very road he fought against. The so called improvements to the Sea to Sky do not make it any safer, they merely encourage higher speeds, so that the inevitable collisions (they are NOT accidents) have higher severities. I was pleased to buy him a cup of (fair trade, shade grown, organic) coffee from the black truck at the Farmer’s market. And also while there I got another bokashi bucket from my friend Al Pasternak. 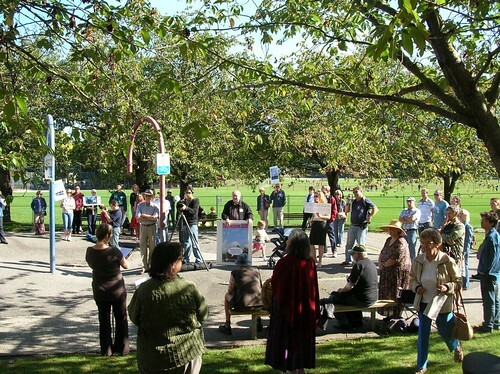 The idea of the rally was to deliver a variety of messages to Gordon Campbell in his own constituency on what a lousy job he has done going green. The benefit of the carbon tax is more than offset by the emissions from the port and highway expansions – but then there is also the neglect of the wild salmon, the power lines through Tsawassen, the P3 run of the river hydro projects – which get approval just for applying, their EA process only being concerned with “mitigation”. The afternoon was spent at the BC Environmental Network’s conference, where Guy Dauncey had to relinquish his spot on the agenda. I had planned to do the same schtick I had done all weekend on how stupid the Gateway is when there are so many better alternatives – but probably accentuating what the good ideas look like as I thought that they would probably know all about the faults. But I changed my mind while listening to Professor William Rees – who spoke before me as has happened at other events. He is a hard act to follow. He spoke without notes or slides about the three recent news stories on global warming which show that everything is happening much faster that the IPCC anticipated. The feedback loops were omitted from the models, which were anyway very conservative in their estimates. So the outcomes are going to be worse and sooner, but our response is slowing or even reversing, because of the adaptive behaviours that we developed as a species are actually getting in the way of a workable response. Now that seemed to put my cheerful little positive and local piece into a very different light. Not only that but when you are talking to seried ranks of empty seats in a large theatre, performance quality suffers. So I just encouraged everyone to sit in the front row – after all there were less than twenty at any one time – and tried to do some dialogue on what a sustainable city might look like. Unfortunately I had to use a mike as they were recording the proceedings but with some gentle pordding we did get some back and forward. They then went into a strategising session – but it seemed to me that they had omitted to specify that these days they are dealing with outright hostility from both federal and provincial governments. Structures which worked when government actually valued dialogue are now not useful. But then my only contact with BCEN is their very useful Landwatch list serve – which was one reason why, as Dani Rubin pointed out, none of the papers Bill Rees quoted were news to any of those present. This is really a stunning turn of events. They are, of course, talking about the British Tories. And that party was almost completely wiped out by Tony Blair. Britain has had a Labour Government since 1997 – and now it looks increasingly likely that they will not survive the next election. Something unimaginable only a few years ago. Mrs Thatcher never once travelled on a train while she was Prime Minister. She regarded the then nationalised British Rail as an anathema, but she could also read a balance sheet. BR was actually doing quite well, and the civil servants at the Department of Transport convinced her that there was nothing to be gained by privatisation but a lot to lose. Mainly lives. So it fell to John Major, her successor, to press ahead with what was probably one of the worst transport policy decisions in Britain in my lifetime. I have never managed to persuade any of my conservative acquaintances that there is a direct relationship between conservatism and conservation. That protecting the environment has a very close affinity with a lot of Tory values. Sadly the influence of the right wing “neoconservatives” overwhelmed the old decent instincts of the party of Disraeli. At one time it was so hard to tell the difference between mainstream Conservatism and Labour voters – and party policies designed to take over the centre of the political spectrum that term “Butskellism” was coined – and combination of the names of two leaders of political thought on either side of the house – Hugh Gaitskell and R A Butler (always known as “Rab” from his initials). Both moderates to a fault. It is inconceivable that Stephen Harper could propose an investment in high speed rail between Toronto Ottawa and Montreal as a way of reducing greenhouse gas emissions – even though that is what it would achieve. For one thing, Canada has been busy blocking even the most moderate international proposals to agree on new limits. We are nowhere near our, very modest and inadequate, Kyoto goals. I cannot say I like David Cameron, but he has certainly shown himself to be a smooth operator. And Gordon Brown must have really been caught off guard. The UK government has simply waffled about important railway questions, including the need to electrify the rest of the system and to build new high speed lines. And the Heathrow fracas has been as embarrassing as the Kingsnorth coal fired power station. Labour now has a very hard time looking progressive let alone green. It would be nice if VIA Rail was even on the radar in our federal election. 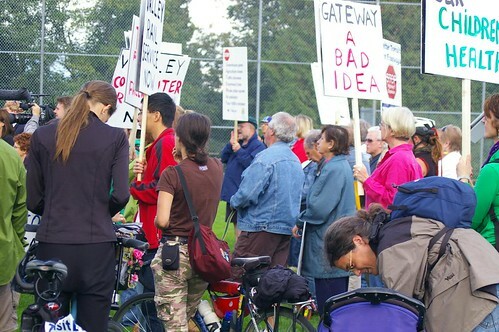 We did not exactly fill the park this afternoon, but the turnout was over a 100 – thus at least giving the lie to Kevin Falcon’s assertion that there are only four people south of the Fraser who are against Gateway. It is very clear that the neighborhood of the park where the rally was held will be severely impacted by the expansion of the Highway and the construction of the South Fraser Perimeter Road – and construction on that has already started with land being cleared between South Fraser Way and the BNSF mainline. I was also greatly encouraged by the number of people who came up to me afterwards and spoke about their concerns. What is perhaps surprising is that Kevin Falcon has adopted a new tactic. At the ceremony for the “opening” of the new Queensborough Bridge north interchange (where community pressure achieved a major redesign of the bike facilities) he spoke about the current economic “uncertainties”, and how the Gateway would help us better weather the uncertain economic future. This is a very skillful tactic, given that it actually flies in the face of everything that has been happening. Rising oil prices and the declining US dollar, as well as recession south of the 49th parallel, have cut imports from Asia and also make it more likely that US made goods will be more competitive, and China will be exporting more to hard currency countries. The banking debacle means that the financial basis of the P3 that is supposed to build all this infrastructure has also become much harder. Credit is not just harder to get, but many of the firms that put these deals together are going to be in serious trouble. Plus, a model which was run at 80c per litre gasoline cost has not produced traffic forecast that anyone can now have any confidence in. I enjoyed listening to all the other speakers – but the one who always impresses is Joe Foy whose passion is authentic and whose rhetoric is unmatched. Much quieter – but equally convincing was Eliza Olson – who spoke about the importance of Burns Bog and revealed the real reason for the SFPR. It has nothing to do with moving containers from Deltaport – but a lot more to do with developing the south bank of the Fraser as an industrial area. I use the word “reveal” because none of the proponents have admitted that this is why the alternative route was never seriously considered. I suspect too that searches of the land registry would show some interesting linkages between those who bought land along the route and BC Liberal party supporters. It has always been clear that the ostensible reasons for the Gateway do not stand up to examination. But the whole thing does make a lot of sense as a real estate ploy. But even that can easily come unstuck, as the real estate market in this region has begun to show signs of the same weakness that is affecting the rest of the western world. the US and the UK are seeing dramatic price drops and buyers are very hesitant to get into the market if it is going to fall further. And the liquidity crunch has got real state harder than any other sector. We are already hearing that there are far too many condos on the market in Vancouver – and the whole house of cards looks very unsteady to me. Not so long ago I was talking to a UBC alumna, who had been on one of those official tours where former students are shown around the campus. She was utterly disgusted as the person leading the tour was simply concerned with selling them on the various real estate developments on the campus. She was particularly offended that this individual knew absolutely nothing about the UBC farm and how important it is to the academic program, apart from anything else. Martin Twigg has done an interview with Gavin Wright, academic coordinator at the Centre for Sustainable Food Systems at UBC, about the farm’s uncertain future, the university’s byzantine planning process and how people can best help to ensure the farm’s survival. You can find it on his spiffy new WordPress blog. It seems to me that UBC has been drifting way off course, and it started when the fees were frozen by Glen Clark. This drove the university ever closer to the commercial market, to do things that they were willing to pay for, as they had no other way to keep funding themselves adequately. This has affected research, teaching and the planning of the campus. The worst effect from my perspective is that given its location – on the end of a peninsular – it is not well located for a student body that does not live on campus. Instead of enjoying the whole range of the university experience, students are commuters – forced ever further out to find affordable accommodation and trapped into long commutes. The UPass worked to get them out of cars, but at great cost to the publicly funded transportation system. Students have to make far too many and too long motorised transport trips, and spend too much time in transit, and thus have much less time for all the activities that are supposed to make university a growth experience. UBC has lost sight of its prime purpose. It has become a developer, not an institute of learning and academic research. One of the great weaknesses of the “free market” model is that it actually fails to recognise diversity of purpose. Every human activity is reduced to a commercial proposition where money making is the one and only measure. UBC should have been smart enough to recognize this, but it either didn’t – or more likely came up with spurious justifications for their self interest of the influential few who dominate decision making – and a great deal has been lost in the pursuit of a stronger financial bottom line.